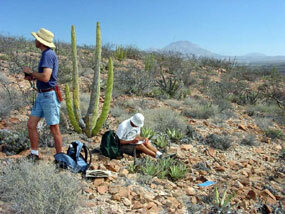 Science Department staff are documenting the biodiversity of the Sonoran Desert region. We already know that this region is one of the richest areas of North America, both in number of species and in lifeforms (plant lifeforms are trees, shrubs, vines, etc.). But some places support more species than others. We have spent the last few decades conducting plant inventories to identify the richest local sites and investigating why they outshine other places. 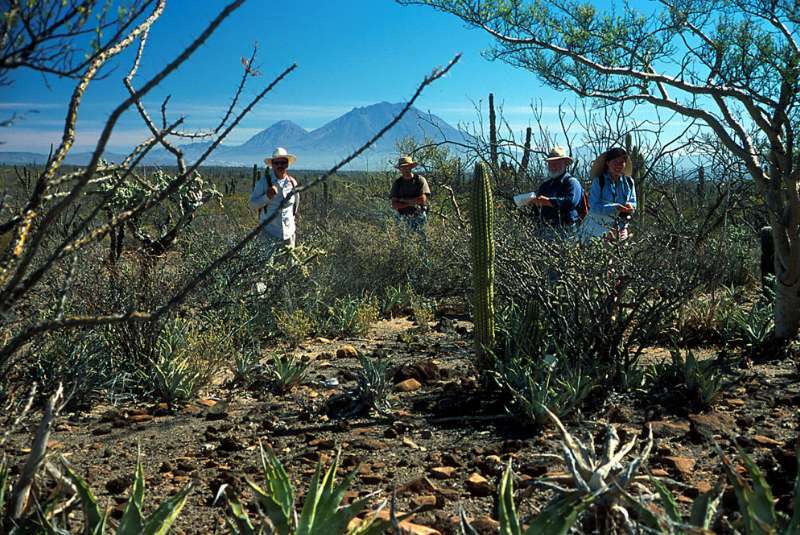 The richest spots in the Sonoran Desert region for plants with the succulent lifeform appear to be in the central Baja California peninsula. The succulent lifeform is an adaptation to arid climates, so warm deserts are rich in succulents (succulent plants are generally intolerant of freezing temperatures). But the number of species per unit area varies greatly from place to place. Cerro Colorado is a small, rocky, volcanic hill just east of San Ignacio , Baja California Sur. Its slopes and surrounding bajadas cover about 10 km 2 (less than 4 mi 2 ) and a modest elevational range of 160-490 m (520 to 1600 ft). It stands alone on an open plain adjacent to the San Ignacio arroyo, on the southern border of the huge Vizcaino Biosphere Reserve. In 1981 Gene Joseph, Bob Perrill, and Mark Dimmitt discovered this site by accident. The abundance of succulent plants immediately grabbed our attention; they were the dominant lifeform. A short hike to the top of the north slope and one of the canyons turned up an impressive list of 26 succulent taxa. The site was dubbed "Succulent Hill"; the first draft of its flora was published in the Cactus and Succulent Journal (US) by Joseph (1985). 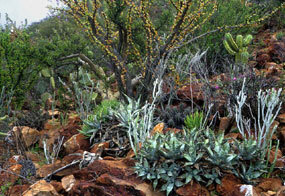 These two images show the density of the vegetation and the diversity of succulents on a small scale on Cerro Colorado. Click photos to enlarge and to see a complete listing of the succulent species visible in the images. 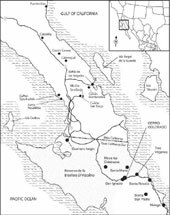 Over the next two decades ASDM staff and colleagues revisited Cerro Colorado several times, and we looked for similarly rich sites elsewhere in the Sonoran Desert . By the end of the century we had not found any, and began to realize that this was a special place that warranted further investigation. 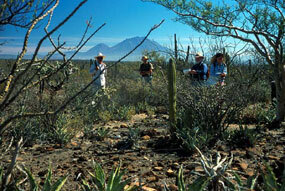 The Cactus and Succulent Society of America provided a grant to conduct an intensive survey of the entire flora of the hill. By the end of two week-long surveys during which we covered all of the microhabitats on the hill (Figure 1), we had increased the list of succulents on Cerro Colorado to 44 [Table 1 (attached below)]. 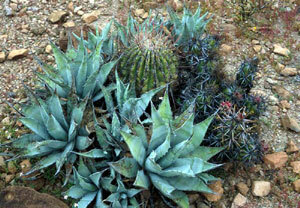 We know of no other small site in the Sonoran Desert region that equals this level of succulent diversity. 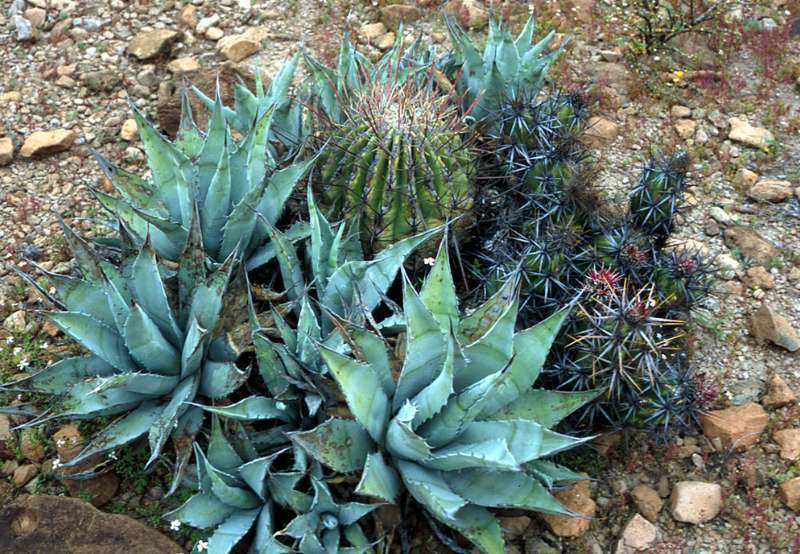 Even nearby hills did not match Cerro Colorado's diversity; the next highest was Cerro Caguama with 31 succulents (Figure 2). Figures 1. (left) and 2. 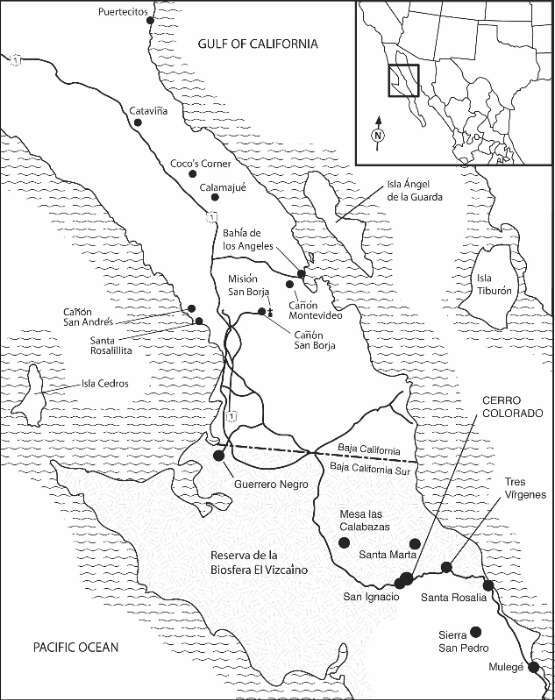 Maps showing the location of Cerro Colorado and other succulent-rich sites in central Baja California. 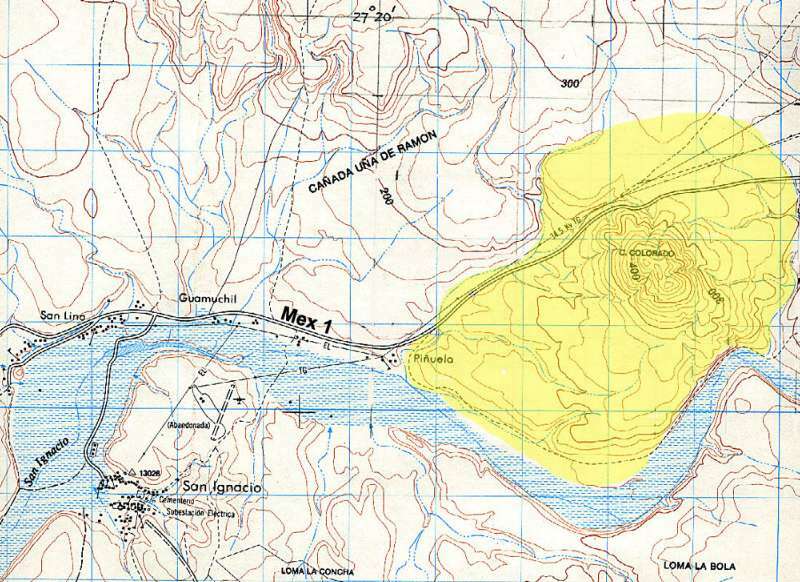 Yellow-shaded area in Fig. 1 was surveyed on foot. 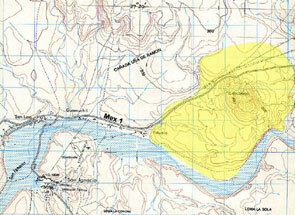 The original description of Cerro Colorado appeared in: Joseph, G. 1985. 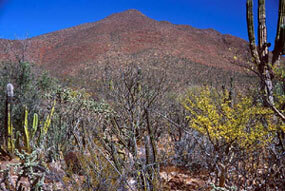 "Succulent Hill" , Baja California . Cactus and Succulent Journal ( U.S. ) 57: 212-213. A popular account of the more recent study will appear in: Dimmitt, Mark A., John F. Wiens, and Thomas R. Van Devender. in press. Rich Succulent Floras in Central Baja California . Cactus and Succulent Journal ( U.S. ). For a more technical treatment, see: Dimmitt, Mark A., Thomas R. Van Devender, and John F. Wiens. in press. Extreme Succulent Plant Diversity Near San Ignacio , Baja California Sur. in : Cartron, Jean-Luc E. and G. Ceballos (eds.). Biodiversity, Ecosystems, and Conservation in Northern Mexico . Oxford U. Press. 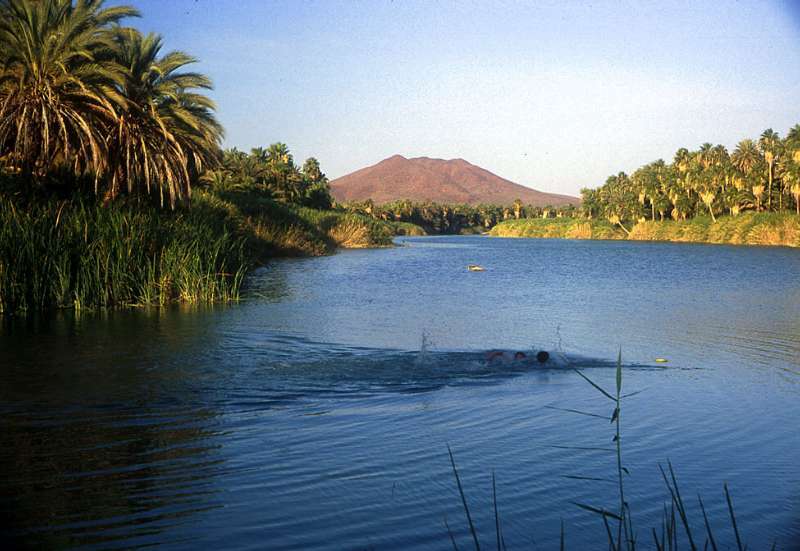 Our work in Mexico was conducted under a permit from José Luís León de la Luz of CIBNOR (Centro de Investigaciones Biológicas del Noroeste, S.C.), La Paz, BCS. 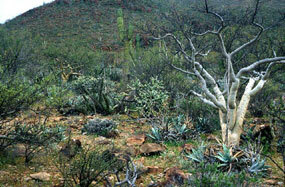 Travel expenses in 2001 and 2002 were covered by a grant from the Cactus and Succulent Society of America . We owe thanks to several people who helped us characterize the succulent life style: Richard S. Felger, Matthew B. Johnson, Gene Joseph, Jon Weeks, James Henrickson, and David Hunt. Thanks to the Desert Museum Botany Department for providing samples of several succulent plants in their collection.